Girls with feathered hair think that there is no other way to stylize their hair except blow dry or side swept bangs. 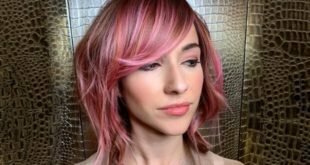 Whether you have short, medium, or long hair, a feather cut hair looks chic and ultra feminine, and there are several flattering ways to style your layers. What is is a Feather Cut? 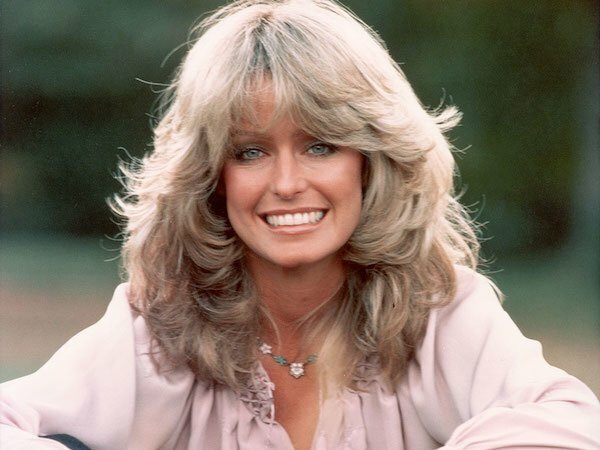 A feather haircut or feathered haircut is a classic hair style that was made popular by Farrah Fawcett during the 1970’s television show, Charlie’s Angels. The haircut gets its name because the hair style resembles the feathers of a bird. Feather cuts for long hair are sometimes called a long shag haircut, or a long-layered feathered cut. The feather cut is achieved by pulling hair straight up towards the sky, then cutting a V-shape (with the bottom point of the V in the center of the head). Thus, the feather cut has shorter length hair at the center of the head and progressively longer lengths toward the side. What is the difference between a feathered haircut and a layered haircut? 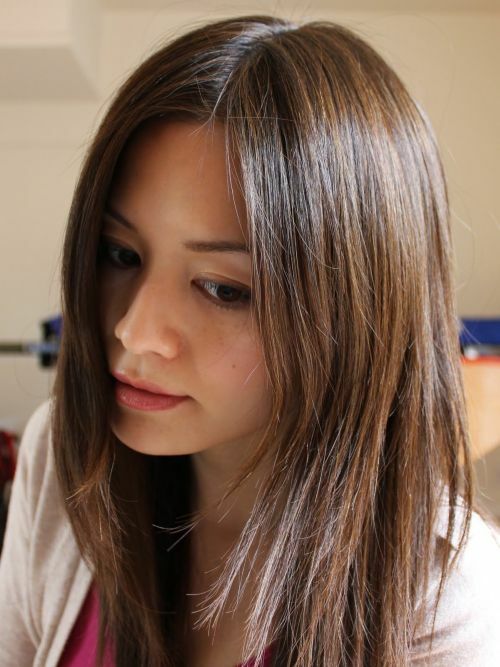 Feathered hair has fine-textured layers sometimes created with a razor. So a feather cut is a variation of a layered cut. The feathering adds texture to a layered cut. A layered cut is created with scissors creating separate layered sections of different lengths of hair. Layering lightens the weight and volume of hair, and is a good choice for people who have lots of hair growth. The layering and feathering hair styles can be combined to create additional looks. What is the difference between a feather cut and a step cut? With step cuts, the layers are choppier. A Step cut is a form of layered cut that is cut into visible steps. This gives a bolder look to the hairstyle and is a contrast from feathering. With the feather cut, the layers are smooth and blended. It’s much softer in appearance compared to a step haircut. 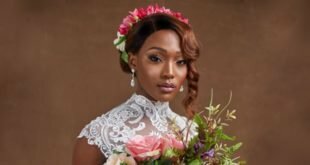 While looking at this list of feather cut hairstyles, you’ll know many ways to style your hair depending on your length. We’ve included short, medium, and long hairstyles for your inspiration into feathered hair. Long hair lends itself to feather cut hairstyles because there are so many possibilities with all that length. The feather haircut looks great with long hair. 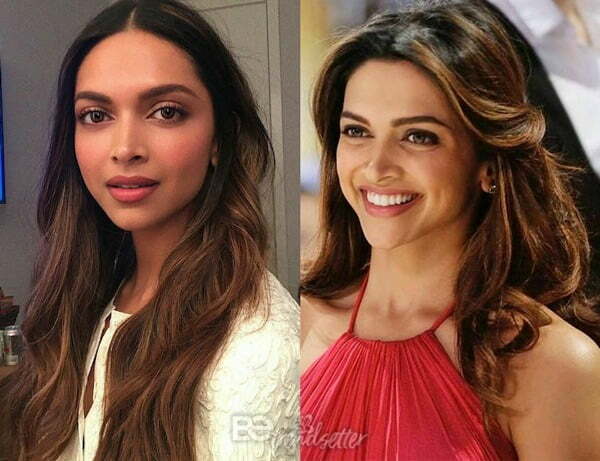 Our first example shows a feather cut for long Indian hair and features Bollywood star, Deepika Padukone. Deepika has lots of healthy hair, and the feather and layer cuts lighten her hairstyle while adding elegance. Kristen Stewart resembles a princess with her long feather cut hairstyle. Kate Upton rocks this beautiful feather cut hair style with large long curls. 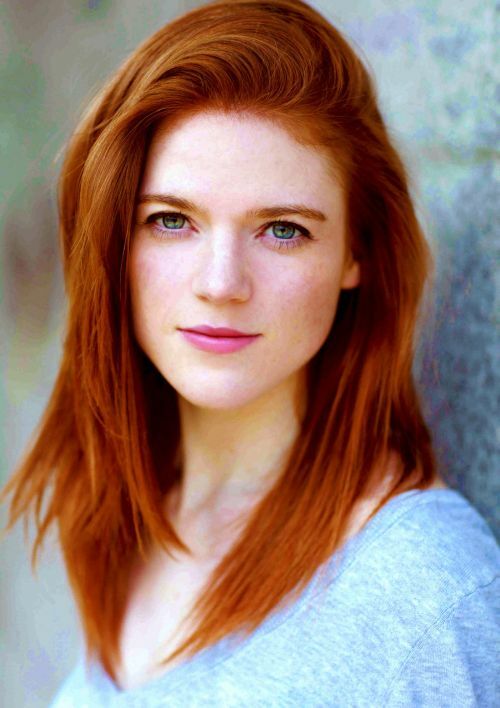 Feather cut long, straight, auburn hair to lighten weight and add femininity. In another classic feather cut hairstyle for redheads, Julia Roberts beaming smile completes the look. Let this pretty woman inspire you to try a feather cut. 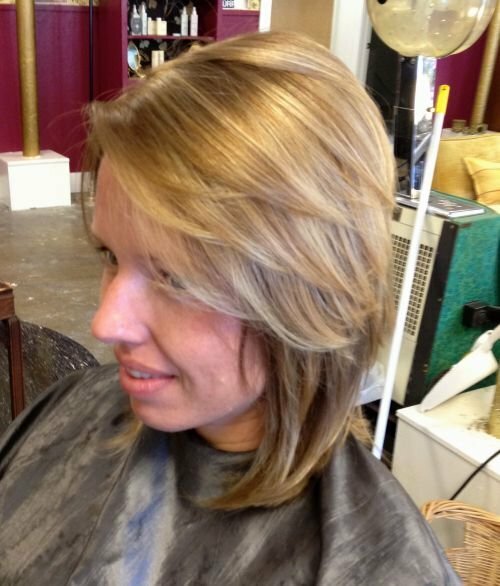 Ramp up your feather cut hair with blonde highlights and long curls. Beautiful and elegant. A feather cut for medium dark brown hair and olive skin tone can look both playful and gorgeous. This hairstyle with long feathered layers give an amazing windswept look. Looking gorgeous in a feather cut hairstyle, this Indian woman is ready for a night on the town. Miley Cyrus with long highlighted blond and brown hair that perfectly shows off a feathered haircut. Megan Fox looks great in any hair style, but here she rocks a feather cut for long hair. Outward facing feather cuts are an amazing way to add bounce and movement to long hair. Ask your stylist to give you feathers in stepped layers, and then you can create any style you want at home. You can use Velcro rollers or large barrel curling iron to create waves or curls accordingly. You can flatten those curls later with a paddle brush and your feathers will get an ultra chic look. This feather cut for long black hair features large gentle curls to create a cascading effect. 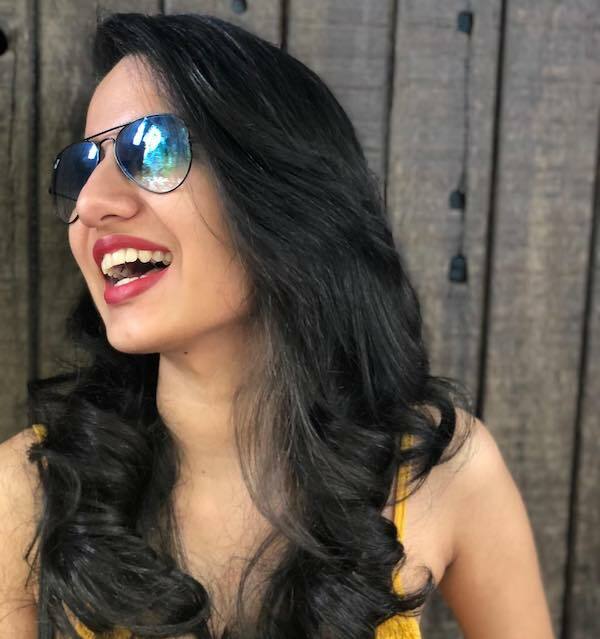 Let your beauty shine through this beautiful hair style. Feathered haircuts created with graduated layers and sectioned bangs jazz up your look when you roll your layers inwards. The key lies in getting patterned graduated layers for a flawless look. Feather cuts are not limited to long hair. Women with short hair can also shine with a feather haircut. Here are some fabulous feathered hair styles for short hair. Short hair can look amazing with the right feather cut. 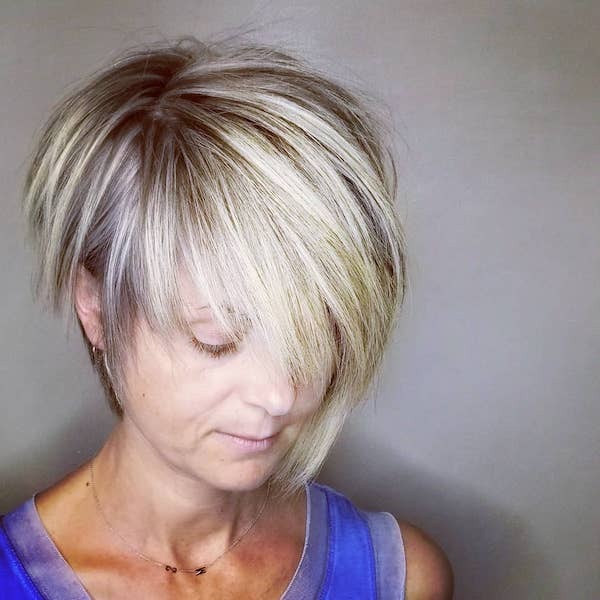 Feather cuts can add volume to women over 40 with short thin hair. 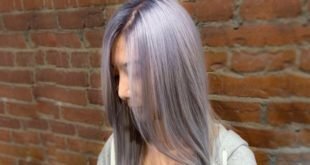 Combine with frosted highlights over dark roots to add even more depth to the hair style. This haircut is seriously feathered and it is a nice way to create a fresh look with fine hair. Blow out with Velcro rollers and you’re all set to go. Side parted hair and feathered bangs with highlights and slight waves look so glamorous and are perfect with an off shoulder dress. Here is a playful blonde feathered haircut that beautifully enhances Kimberly Wyatt’s eyes. 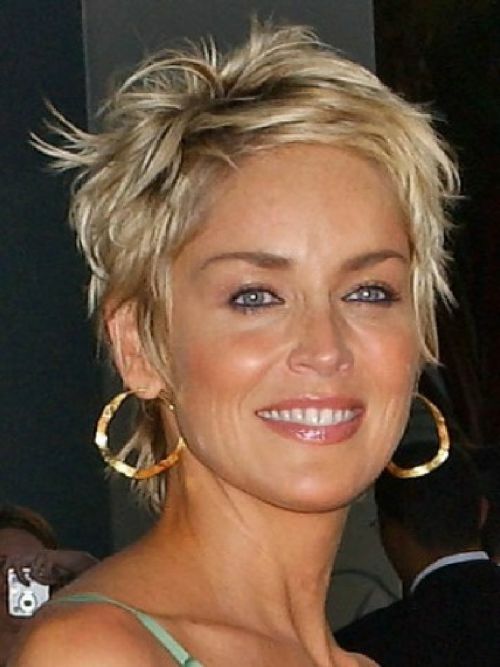 Bed head hairdo that is done on razor cut layers looks classy in this photo of Sharon Stone. Play a little peek-a-boo with this outward feathered cut bob for short hair. Asymmetrical A line feathered bob haircut with fawn highlights looks pretty when it is smoothed out. Choppy layers on a very short bob cut have their beauty in the darker roots. Heidi Klum shows cascading layers on a head full of thick hair with feathered straight bangs on the forehead to add to the exquisiteness of highlights. This model has blown out her jet black hair and she has deeply side swept her hair to complement her round face. Here is another one wearing side swept feathers on her dark blonde hair. The feathered fringes add a shag-like texture to the hairstyle. 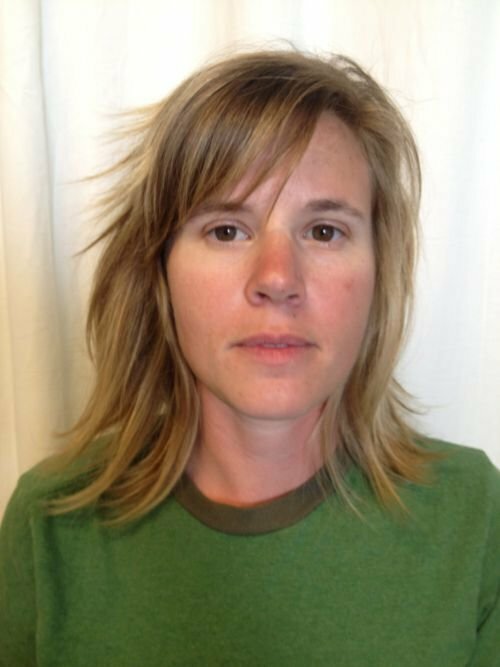 It’s a great feather cut with side bangs. 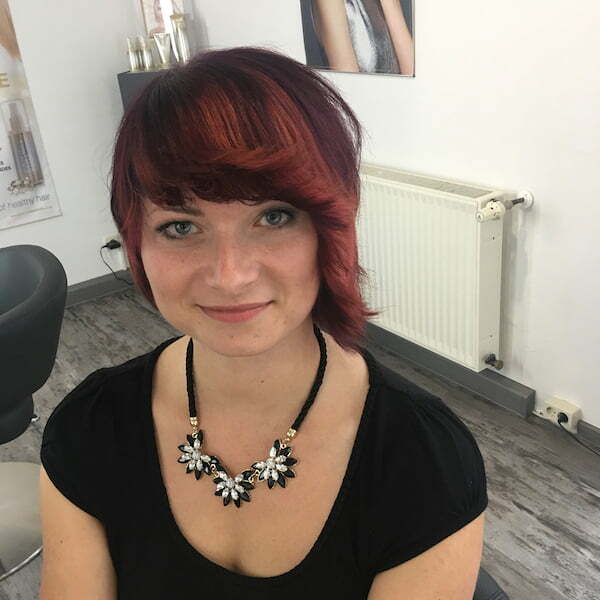 This hairstyle features roughly chopped layers with heavy bangs and one can reduce the hair thickness with this haircut. 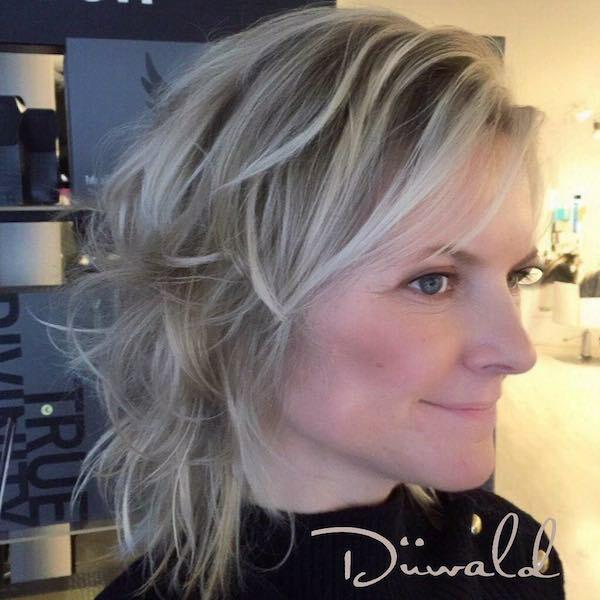 A line bob with thin feathered bangs and contrasting highlights looks pretty on the model’s triangle face. This hairstyle is feathered from the center of the head towards temples and it is a perfect way to divert attention from fine lines and wrinkles. It’s another great feather cut for women over 50. Emily Browning’s sleek feathered layers are straightened for a softened and sophisticated look. Here is an awesome style for a bed head look created on fine hair. Annette Bening shows an age friendly feathered hairstyle for fine blonde hair that you can try if you’re over 50. Medium length feather cut hairstyles look at their best when you style them with some waves or curls. Give your hair a unique personality with a mix of curls, bangs, and layers. 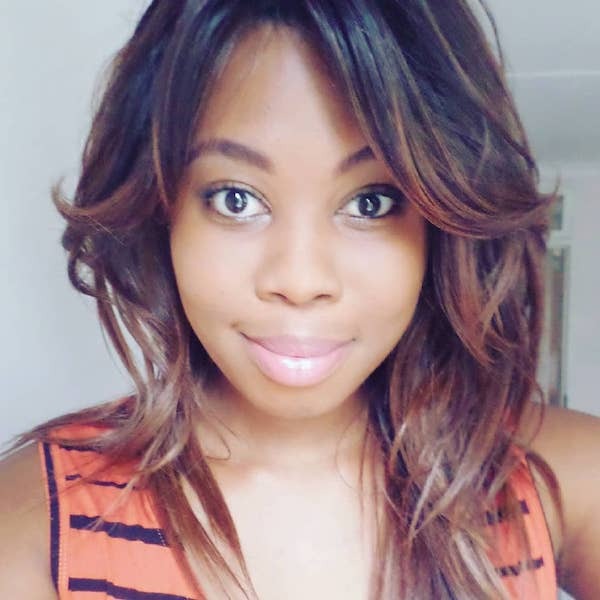 You’ll see that the medium length is the easiest to style, and is fun and playful. You can try as many things as you want with this length. Check out below images for inspiration. 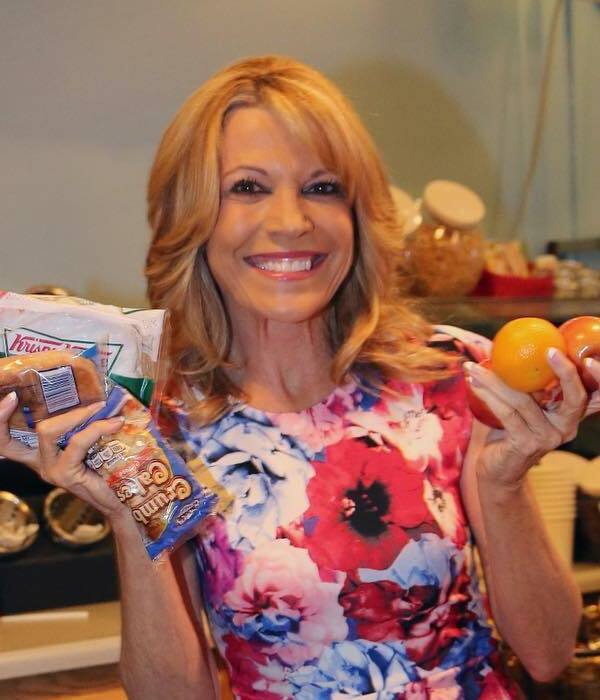 Vanna White with a gorgeous feathered cut for medium hair looks positively radiant! Feather cuts add style and texture to straightened hair. A feather cut for thin hair is an easy hairstyle to achieve an amazing look. 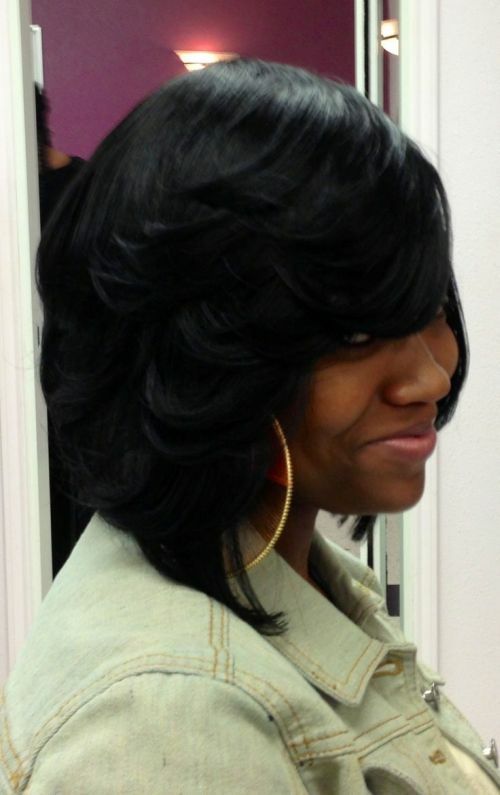 A woman with medium length, fine thin hair is a natural for an outward feathered cut. Selena Gomez with a feather cut for medium length hair. She shows us that feather cuts are not just for the 70’s and 80’s generation. Jennifer Aniston shows us a look we’re all familiar with, a medium length feather haircut. Hollywood actress Michelle Monaghan poses with a feathered cut for medium length hair. Here are some straight feather cuts to the ends of medium length hair. Feathering Asian hair is a way to add interest and texture to an otherwise ordinary straight hairstyle. Maria Menounos hairstyles include feathered ends for straight medium hair. We hope you enjoyed our collection of feather cut hair styles and found some inspiration for your next look. What do you think about feather cuts? Let us know your thoughts in the comment box below. Thanks for sharing these hairstyles for long hair. I kinda liking the first one under Feather Cut for short hair. Thank you for sharing different hairstyles for variety of hair lengths. I am rocking my short hair now, I will try this feather cut. Hi my name is Lora Wood. I came to your 45 Feather Cut Hairstyles For Short, Medium, And Long Hair page and found it to be super helpful for me. I managed to find several hair cuts that I want to try.